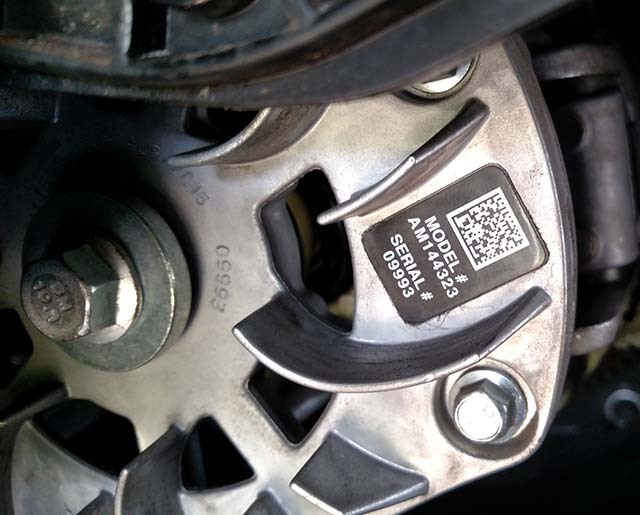 10-18 - How to Fix the AM144323 clutch on a John Deere 590i gator without replacing it. Hard to shift John Deere Gator. So, your John Deere Gator is getting hard to shift. It sticks in gear and you can't get it out of gear. Well, it's not the transmission, it's the AM144323 CVT clutch. 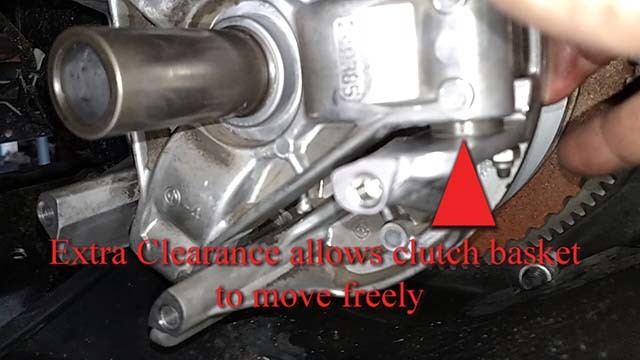 The fingers on the clutch basket warp and make the clutch spider stick in the slides, causing the clutch not to release all the way when the engine is idling. 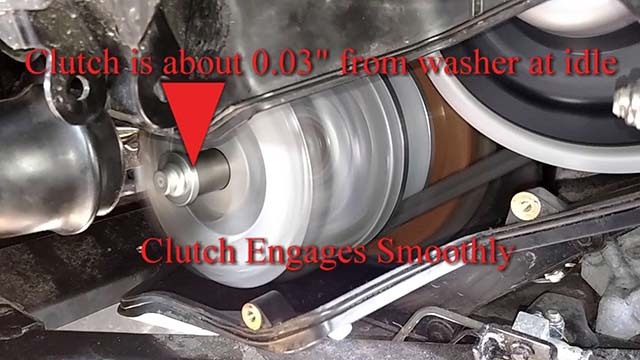 Since the gears in the transmission are cut to hold the gears engaged when under load, the clutch not fully releasing makes it next to impossible to shift gears. The AM144323 replacement clutch's are all over the internet for sale for $474 - $689. You don't need a new clutch. A couple wrenches, sockets, 320 & 1000 grit sandpaper and it's fixed. Remove the upper Clutch and Belt cover. I think there were (8) bolts with 5/16" heads on them. The cover is two pieces, and upper and lower. I was able to do this with jut the upper cover removed. I removed the left rear tire to make it easier. 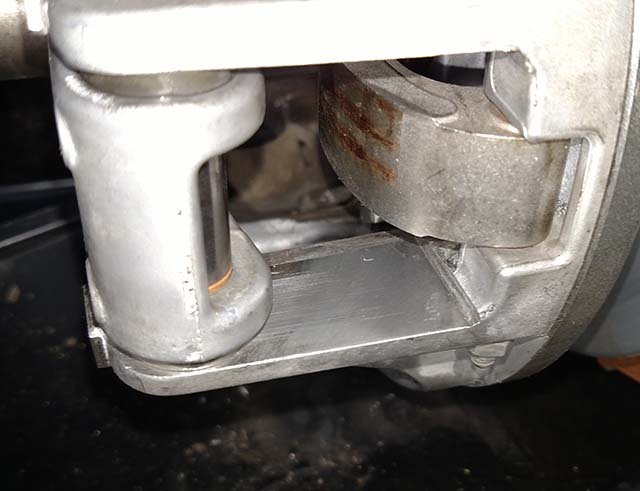 Remove the Bolt and washer that holds the clutch on the engine crankshaft. Don't worry, the clutch will not come off the crankshaft. 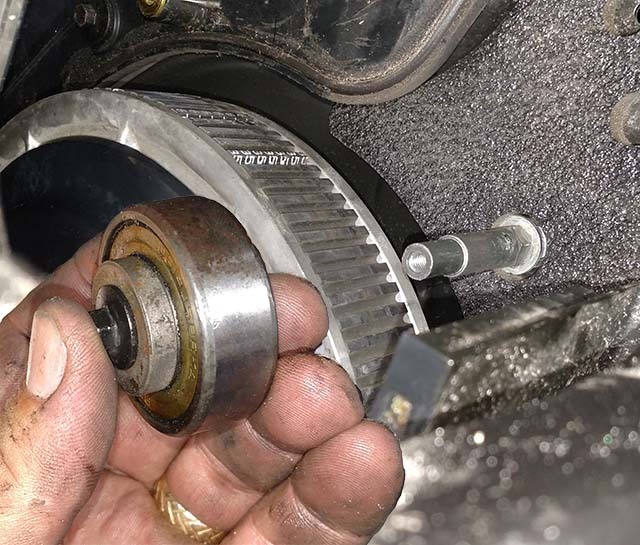 Remove the (6) 3/8" head bolts around the clutch face. Try and remove them evenly so as not to bend the basket. You will have to turn the clutch/crankshaft with your hands to get at all of them. Remove the clutch faceplate. Now remove the spring and the spacer. The spacer has a front and back to it. On mine the lip was towards the engine. 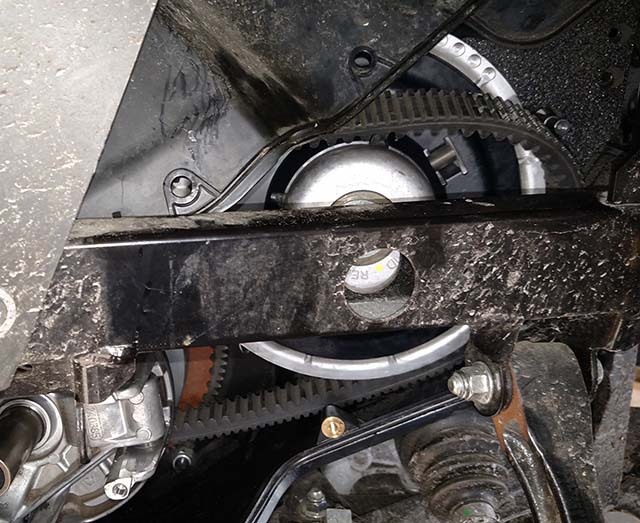 Remove the belt retaining ball bearing above the rear transmission pulley. It comes off with a 5/16 head bolt on the bearing side. It has two spacers with shoulders on them to center the bearing on the bolt. Remove the belt. You just have to walk it over the top of the transmission pulley. The belt has a direction! Make sure the arrow on the belt points towards the front of the gator when on top. Slide the clutch basket back and forth on the crankshaft feeling for friction. Ideally it should slide smoothly, but it won't. It will bind. It will bind when the basket is pulled away from the engine. That's where it runs at idle. The faster the RPM, the closer it moves to the engine, making the engine's CVT pulley bigger in diameter. 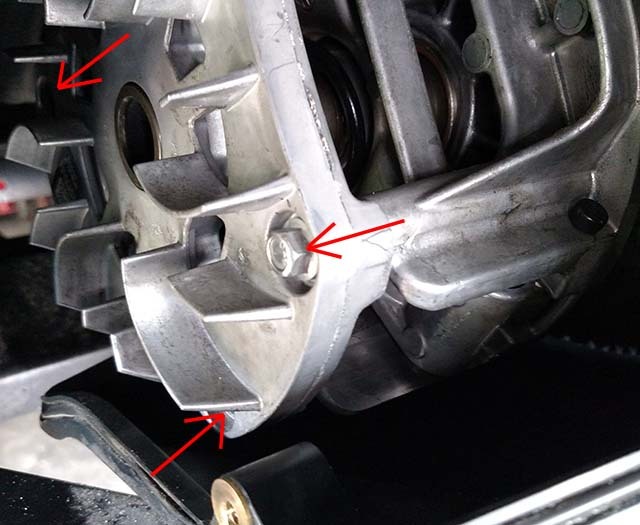 There are (6) round metallic bushings that slide against (6) slides on the clutch basket. These bushings are tough. I was not able to sand them down to make more clearance. Instead, I sanded the slides in the clutch basket down with 320 grit sandpaper, then polished the slides with 1000 grit sandpaper, using Alumaslick aluminum lubricant while sanding. Carefull not to get the Alumaslick on the belt surfaces. If you do, wipe the belt surface down with carb or brake cleaner. Push the clutch basket all the way towards the engine. 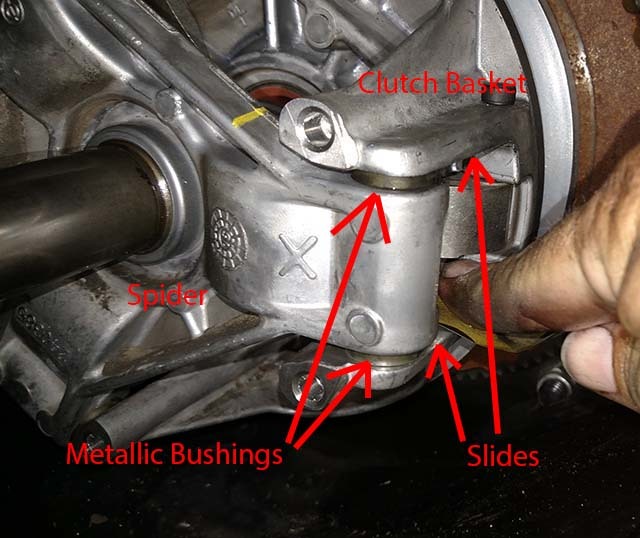 This allows you to sand down the (6) slides on the clutch basket where the spider rides at low RPM. Sand and polish both sides of the clutch basket slides. You will have to turn the clutch to get at all three sets of slides. When the slides are sanded and polished, they should look something like this. No more scoring on the end of the slides towards the engine. 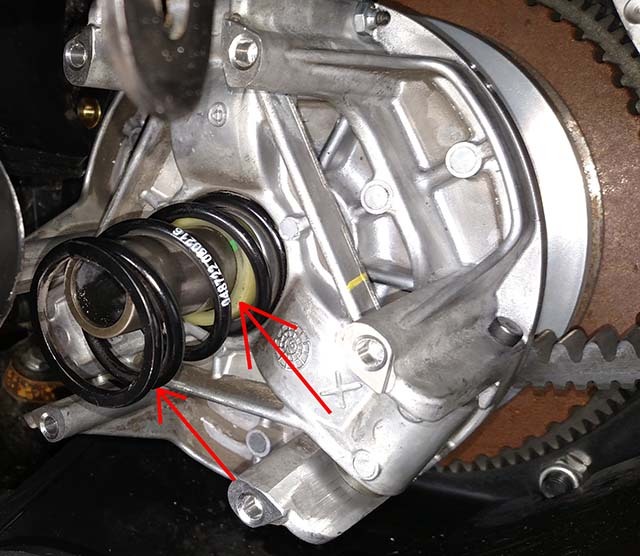 Wipe the belt surface of the pulley down with carb or brake cleaner before installing the belt. I left the Alumaslick on the slides, but no where else. 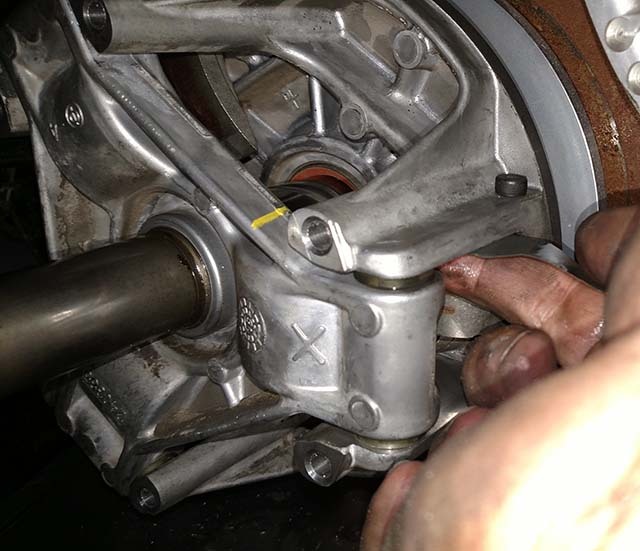 The belt touches the shaft at idle, so don't lubricate the shaft where the clutch basket slides on it. Pay attention to the belt direction. Pay attention to the direction of the spacer that goes under the spring. The lip on mine was towards the engine. Install the spacer on the shaft. Install the spring on the shaft. Install the clutch face plate using the (6) 3/8" head bolts. Don't over tighten it. Mine weren't to tight from the factory. Install the bolt and washer that holds the clutch on the crankshaft. 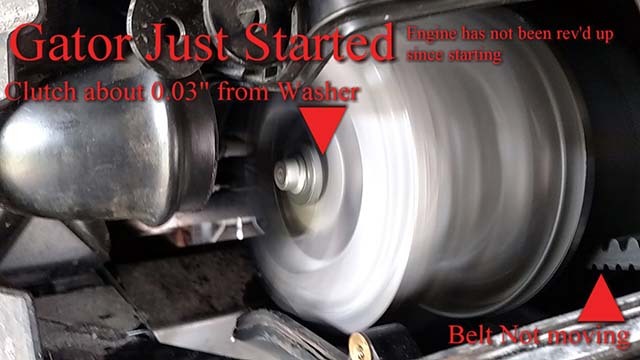 Clean the belt surfaces of the pulley with carb or brake cleaner. Install the belt. Put it on the clutch pulley first. 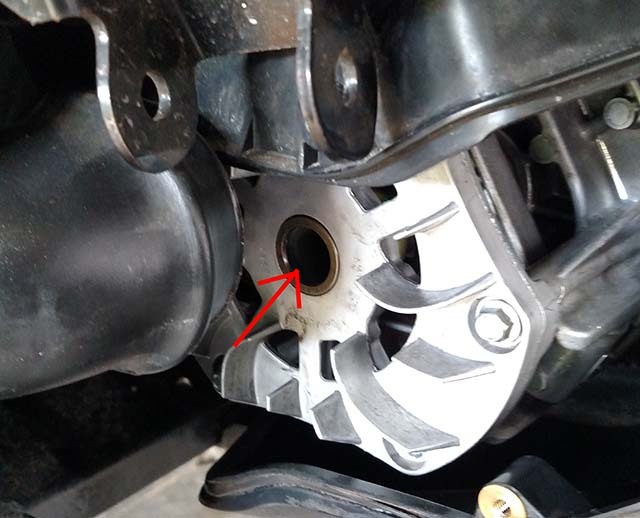 I put a small screwdriver in a notch on the inside of the belt and rotated it around the rear transmision pulley, flipping it onto the transmision pulley. Install the retaining ball bearing. Enjoy how easy your gator shifts and how nice it starts and stops with no lurching! Final Thought - John Deere really let me down on this. Our gator doesn't even have 42 hours on it and is less than two years old. This is a design flaw. But is it? It made it through warranty. The dealers go through these clutches like mad. Look online for the part # AM144323, everyone is selling them. Even Amazon. When it can be fixed for the cost of two pieces of sandpaper. Pretty sad. www.RockAuto.com has the best price on all auto parts, and their service is great. I have been dealing with them for years and I've never had an issue. Give them a try. You won't be disappointed.